What do you think...... does celebrity ownership add anything on a vintage Jaguar.....? 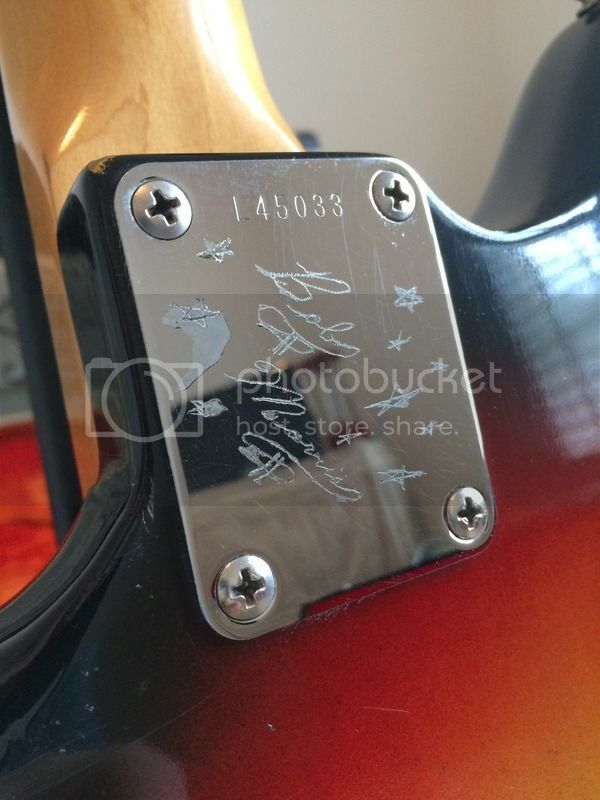 I have one that I am thinking of cutting out of my collection, and I want to be sure that I price it realistically. 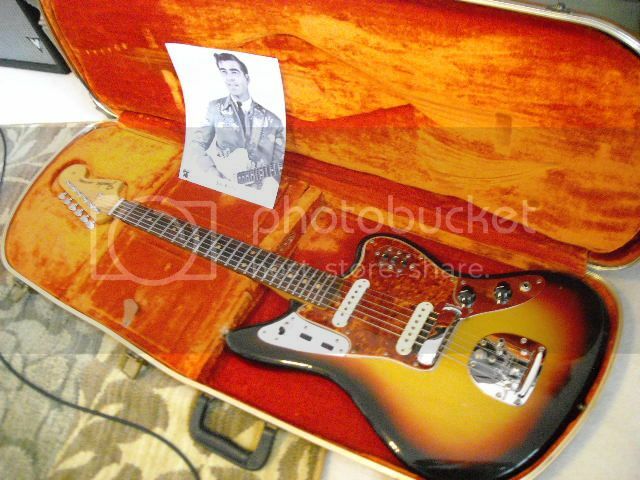 It is a L prefix serial number, with a fair amount of his personal case candy from the '70s and his pro Fender 'sunglass' case....... std 3C sunburst in terrific original condition. I would appreciate you honest opinion regarding potential upcharge. The man who wrote the theme song 'Buckaroo' for Buck Owens.... also wrote 'Made in Japan' for Buck. He and his good friend Don Rich were the ones who convinced Buck to record the original 'Streets of Bakersfield' written by little known Seattle native Homer Joy. 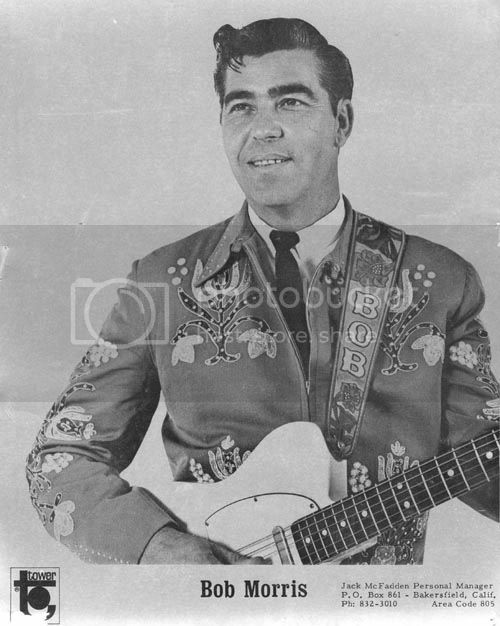 You can see Bob on several Buck Owens Ranch TV shows from the early to late '60s. 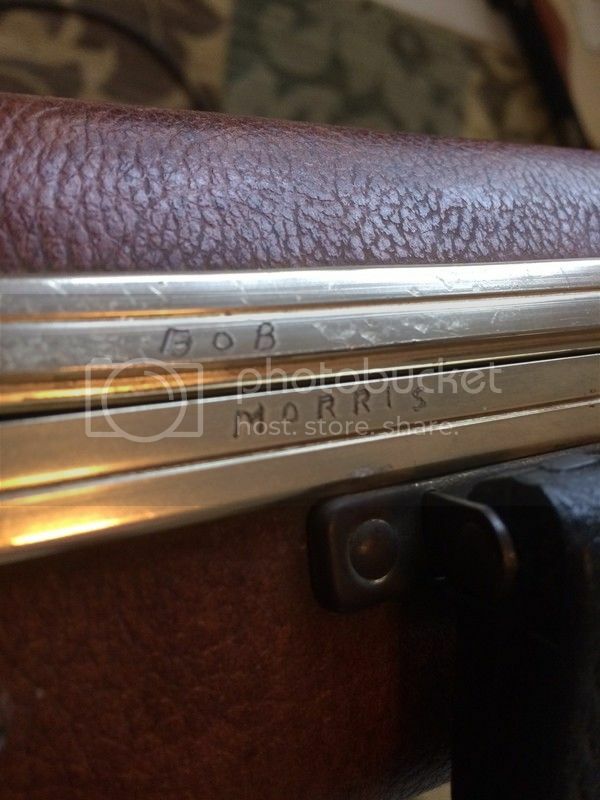 In episode #42 (on youtube ) Bob and his wife Faye were both guest stars on the show, and Buck mentions that Bob had played one instrument or another on most of his records in the past. He and Don do their version of 'The Orange Blossom Special'. He also wrote 'Same train, Different Time' for Merle Haggard, and others he wrote for include his good friend Don Rich, Susan Raye, Buddy Allen, Eddie Miller and David Frizzell. In some circles he was known as 'Bakersfield' Bob Morris as he had a hand in the development of the famous 'Bakersfield Sound' that spent many weeks and years on the Country Music charts. Both Bob and Faye Hardin recorded and released several of their own songs over the years. Earlier in his career he was a session player for the West Coast Playboys in the mid to late '50s, and in 1959 he was a member of 'The Champs' with Jimmy Seals, Dash Crofts, Jerry Cole and a new kid by the name of Glen Campbell. Bob and Faye owned a small recording studio in Pico Rivera, CA (now Whittier) called Sundown Studios. Bob was also under contract with Gene Autry's Challenge Record label and Fender. If ever you saw Bob Morris on stage, on TV, or anywhere.... if he had a guitar in his hands, it was always a Fender. It will somewhat, but not as much as a well-known rock star, and you need to have the proof of ownership authenticated, then have it appraised by someone qualified to appraise celebrity ownership. That sunglasses case is worth quite a lot, by the way. I only buy synths with mini keys as I like the shortscale synths. Thanks... I agree on both fronts. I think I will post some pictures and what I think it is worth to see if I am thinking right. Pre-CBS Jags are $2-3x ..... ? Pictures as discussed..... I thought I was going to be reasonable at $3,750.- ........for a 1964 with the not often seen pro sunglass case, case candy, pictures, paperwork. His flatwound strings are still on it, plenty of cool case candy, orig trem bar, mute bar still has orig rubber, old steel pick case full of vintage Fender picks, Fender cow skin strap un-opened, orig Fender cord, un-opened Fender string set, and a Fender marked Parker Body Guard showing Patent Pending. All cool vintage gear. 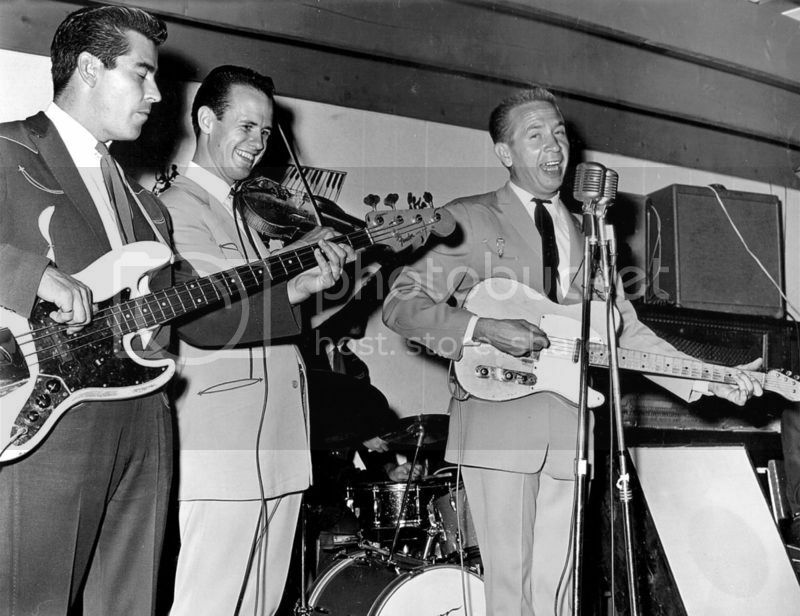 Bob Morris, Don Rich and Buck Owens on stage early 1960's. I also have paperwork form his days with The Champs, Jim Seals, Dash Crofts, Glen Campbell, and Jerry Cole......including pictures. 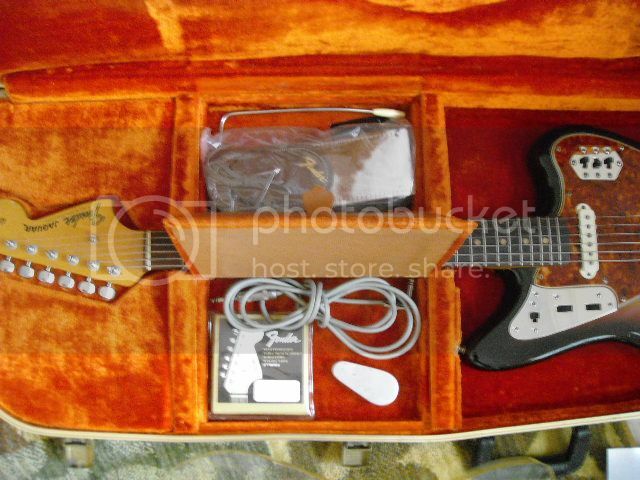 Yes 1964 jags sell on reverb all day Long for 2-3k. The vintage market has stalled. This one will go for more cause of the case. It's probably worth more based on the condition and case alone, then the celebrity thing, you have to get a professional appraisal because no one on here is an expert on that. So if I ask $3950.- do you think I can get my $3750.- ??? Where is the best place to list it ? Thanks for all who rendered an opinion. That's a great looking guitar. It looks to be in great shape, and with the case and all the case candy in tact you may be able to get what you're looking for if you're patient and find the right buyer. Two years ago it would have sold instantly. I don't think the celebrity angle will mean much for most people unless they happen to be a huge fan AND happen to be in the market to buy a vintage Jaguar. If anything the scratched out neck plate and case may even detract from the price with the vintage collector types (the same people that pay the extra for the case candy etc). I think you'd really be looking to sell to a guitar show buyer rather than the average joe. Had it been a custom colour you would find it easier to sell. Sunburst tends to be the cheapest just because it's the most common. 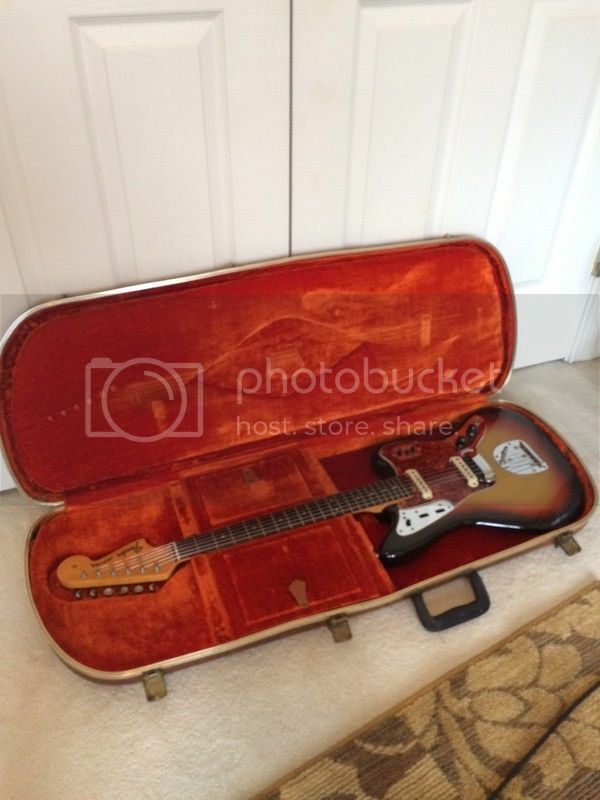 You may even find selling the case and all the case candy etc brings more money than it would add if you were to sell it with the guitar but you'd need to investigate that further. The biggest issue selling vintage gear now is that back when the UK pound was way stronger than the dollar we would pay up to �2K for something like this, so loads of them would be exported to the UK as it was a good price for us and an easy sell for US sellers. Back then that used to equate to $3- 3.5 k. Now with the exchange rate all in the toilet and vintage prices dropping everywhere that �2k equates to far less USD than it used to. For a while here in the UK the prices steadily went up until most buyers realised they were paying well over the odds and sales started to slump. Why don't you have it appraised by George Gruhn? It only costs $50 and you don't actually have to bring it to him,just send pictures and information.He may offer to buy it or sell it for you if he thinks it is valuable. Even if he doesn't his appraisal letter will add value to the guitar. that finish is amazing looking. It has some bumps and bruises.... but for its age its pretty darn good. He did use the body guard that is with it so it obviously did its part. he was smart enough to take it off. its been a few years but i remember seeing a closet classic looking jaguar, but it had sat with the body guard on, and when it was removed it ended up taking off the finish off of the sides. Actually I took it off about 2000 !! !